Julie W. Chang, The Secret Garden (detail), Salesforce Transit Center Grand Hall, 2018. SAN FRANCISCO – The San Francisco Arts Commission (SFAC) in partnership with the Transbay Joint Powers Authority (TJPA) unveils four permanent artworks by artists James Carpenter, Julie W. Chang, Jenny Holzer and Ned Kahn. Each artwork represents a close collaboration between the artists and Pelli Clark Pelli Architects, blurring the lines between art and architecture. The artworks engage and enrich the experience of visitors to the new Salesforce Transit Center, which will open to the public on August 11. On May 15, 2008, the TJPA Board of Directors passed a resolution authorizing an intergovernmental agreement with the SFAC to provide assistance in selecting, acquiring and managing the installation of public art as part of the Transbay Program. The TJPA voluntarily committed $4.75 million to fund the acquisition of artwork in the spirit of the City’s “Percent for Art Ordinance,” which allocates two percent of construction costs for the inclusion of public art in the City’s civic structures and facilities. “The TJPA is proud to partner with the San Francisco Arts Commission to offer travelers, visitors and Bay Area residents with a Public Art Program that not only inspires us, but one that reflects our vibrant and diverse culture and our commitment to environmental sustainability. I am confident that these unique art pieces will attract visitors both locally and from around the world contributing to the success of the Transit Center. I thank the Arts Commission and the artists for their works that will inspire generations,” said Mark Zabaneh, executive director of the TJPA. Pedestrians entering the building through Shaw Alley will pass through an architecturally integrated and functional light sculpture by acclaimed New York-based artist James Carpenter. Parallel Light Fields consists of a field of 54 illuminated light fins set into the ceiling plane. Below are 42 illuminated large glass pavers and a series of lit benches that correspond to the location of the light fins The two fields of light along the ceiling and the ground create a unique and dramatic landscape and a sense of movement and directionality that links the Transbay Transit Center to the City. *Shaw Alley still currently under construction. Estimated completion is fall 2018. Once inside the Grand Hall, visitors encounter a show-stopping 23,000-square-foot terrazzo floor by San Francisco-artist Julie W. Chang. Secret Garden welcomes visitors into a richly colored inviting environment that evokes a lush sunlit Victorian garden. Mined from local ecology, design elements include California poppies (the state flower) and jewel-toned hummingbirds. Integrated into the design is a subtle overlay of icons and patterns that draw from the rich tapestry of people and cultures across the Bay Area. Motifs include flower-like circular rings from an Indian sari; cloud-like curves inspired by Chinese embroidery; Japanese crests; diamonds and chevrons found in a variety of sources including African textiles and Grecian pottery and star and cross shapes from Islamic tiles. Throughout the design, symbols migrate, cross boundaries and become transformed by encounters with other forms, offering moments of surprise and delight for commuters and visitors going about their daily lives. I was inspired by a line from the 1911 children's novel, The Secret Garden. “In secret places we can think and imagine, we can feel angry or sad in peace. There is something to be said for just being, without worrying about offending anyone.” In my work, I use patterns to bring intimate, domestic shapes into public view - with the intention of disrupting normal habits of seeing. By transporting visitors into a lush Victorian garden in the midst of their daily commute, my hope is to open up such a place within the Grand Hall, one that is warm, inviting and celebrates the diversity of people and cultures across the Bay Area. 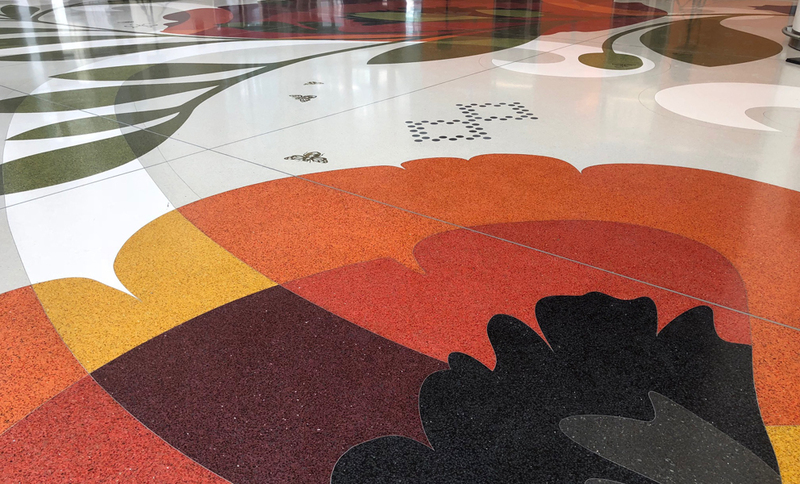 The work was fabricated by San Francisco-based Associated Terrazzo who worked hand in hand with the artist to select colors and materials to ensure that every detail of the project matched the artist’s intent. It is a perfect example of old world artisan craftsmanship applied to a contemporary artist’s design and is reflective of the successful collaboration between artist, architects and the fabricators. Crowning the Grand Hall and surrounding the sculptural light column which is an important architectural hallmark of the building is a large scale LED artwork by internationally renowned artist Jenny Holzer. Acclaimed for her LED artworks and projections that incorporate her trademark and revelatory truisms, for her first permanent public artwork in San Francisco Holzer designed a scrolling LED installation that is 16 feet high and wraps around 182 feet of the elliptical glass enclosure that encircles and illuminates the Grand Hall light column on the bus deck level. White Light uses text specific to the San Francisco Bay Area and California derived from historical archives and authors who wrote about the Bay Area, such as Edith A. Jenkins and Alejandro Murguía. Holzer has also included some of her own writings and phrases. “I really like this building, especially what's on the roof. I thought I'd offer people plenty to read and watch while they visit or wait to travel, and make the building throb and glow at night,” says Holzer. Integrated into the design of the elevated Salesforce Park designed by Peter Walker Associates Landscape Architects is Bus Fountain, by Bay Area artist Ned Kahn. Known for creating inventive and original kinetic works that are a synthesis of art, technology and nature, Kahn created a 1,000-foot-long interactive linear fountain with water jets that respond to the actual movement of buses on the deck below. Busses rolling in and out of the station trigger hundreds of sensors located in the ceiling of the bus deck that control the frequency, motion and height of the water jets in the fountain making the arrivals and departures of the buses visible and tangible through their choreographed effect on the water. “I am quite intrigued with the idea of an artwork whose motion is intrinsically linked to the present moment. With no reference to the past or the future, the Bus Fountain will use water to paint an exact, moment-to-moment rendering of the passage of the vehicles below. The release of the choreography to a complex and ever-changing energy flow is the crux of the artwork,” states Kahn. The building will officially open to the public on August 11, 2018 at noon with a free and open to the public Neighborhood Block Party when the public will get their first chance to view these public art pieces. Service on the Bus Deck begins August 12, 2018. The San Francisco Arts Commission is the City agency that champions the arts as essential to daily life by investing in a vibrant arts community, enlivening the urban environment and shaping innovative cultural policy. For more information, visit sfartscommission.org. The Transbay Joint Powers Authority (TJPA) is a historic collaboration of Bay Area government and transportation agencies including the City and County of San Francisco, the Alameda-Contra Costa Transit District, the Peninsula Corridor Joint Powers Board, the California High Speed Rail Authority, and Caltrans (ex officio) and is overseen by an eight-member Board of Directors. The TJPA is responsible for the finance, design, development, construction, and operation of the Transbay Program, a visionary transportation and housing project that consists of three interconnected elements: replacing the former Transbay Terminal with a state of the art, world class Transit Center; extending Caltrain and California High-Speed Rail underground from Caltrain’s current terminus at 4th and King streets to the new Transit Center; and creating a new neighborhood with homes, offices, parks, open space, and shops in and around the Transit Center. The program is a model for smart growth and Transit Oriented Development. To fully open in 2018, the Salesforce Transit Center meets the needs of a growing region and City with a 21st Century, world class transit center serving transportation systems throughout the Bay Area. The Center will serve AC Transit, Greyhound, Muni, Amtrak, Golden Gate Transit, Paratransit, and WestCat Lynx, with close proximity to SamTrans, Muni Metro, and BART and in the future will serve Caltrain and California High Speed Rail. The Center includes a five-acre rooftop park and more than 100,000 square feet of retail. Bounded by Mission, Howard, Beale and Second streets, the Center is owned and operated by the Transbay Joint Powers Authority. The Transit Center project was funded by the U.S. Department of Transportation, the State of California, the Metropolitan Transportation Commission, the San Francisco County Transportation Authority, the City and County of San Francisco, the San Mateo County Transportation Authority and AC Transit. The name of the Transit Center is the result of a naming rights agreement with Salesforce that helps fund operating costs.